This book is by Mitsugi Saotome, one of the few remaining students of Aikido Founder Morihei Ueshiba. Saotome Sensei had 15 years of long term, in-depth practice with O Sensei Morihei Ueshiba. This is Saotome Sensei’s fourth book. His first book is Aikido and the Harmony of Nature, published in 1986 by SEDIREP. His second book is The Principles of Aikido, published in 1989 by Shambhala. His third book is Aikido Living By Design, published in 2003 by Arete Press/Aikido Today Magazine. 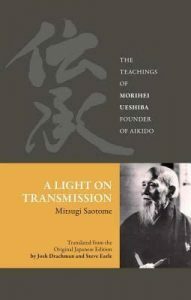 A Light on Transmission is subtitled The Teachings of Morihei Ueshiba Founder of Aikido and is a personal memoir of Saotome Sensei’s relationship with the Founder. There are many stories from Saotome Sensei’s training with the Founder. He then very effectively provides an instructional context that can be applied to practice both on and off the mat. There are also many photographs of Saotome Sensei training with O Sensei. Cedar Forge Press has done a good job of high quality book design in a hard cover and nicely bound format. The book does not focus on specific techniques (his book The Principles of Aikido does that). It offers very deep approaches to training that are the result of Saotome Sensei’s lifetime of dedicated training and teaching. He also shares his views and experiences on the spiritual aspects of Aikido practice and Japanese culture. Chapter 1 provides information on the founder’s life and how the art was created and spread throughout Japan and the world. This chapter discusses many of the deepest elements of Aikido cosmology and spirituality. The Realization of Divine Love and The Hidden Secrets of the Martial Arts comes through Discovery of the Wellspring of Life. The Founder: Your very existence as a living entity with a unique personality is nothing less than a miracle and expression of universal love. Short of that realization, you cannot expect either to master Aikido or to become an example of what it means to be a compassionate human being. Saotome: I am a miracle? This chapter provides guidance on how to apply the deep teaching outlined in the earlier chapters into on the mat training. “Ichikawa-san,” O Sensei responded. This man, Ueshiba, is just an old fool. The contribution of Japanese culture and its place in the world is the focus of this chapter. Here Saotome Sensei discusses his own legacy and accomplishments as someone entering his eighth decade and with over 60 years of dedicated training and teaching. This book and Saotome Sensei’s lifelong dedication to the practice and sharing of Aikido is a wonderful example of contributing to this worthy goal.